I would love to have them but I can't bust out another $1000 on Deadpool again so soon. OMG lookit what HOT TOPIC has!!!!! PoolFan wrote: I would love to have them but I can't bust out another $1000 on Deadpool again so soon. They cost me around AU$1050 (US$800) shipped for both, and that was with the high shipping cost to Australia due to their weight (120 euros). From what I saw on Statue Forum, the US shipping was a lot less so you should pay much less than I did overall. I was hanging out for a sale or similar, but it looks like the Australia government is lowering the amount for when you have to pay import tax in Aus from July 1, so I wanted them ordered, shipped and in my hands before that date in case waiting for a discount ended up costing me more. Wolfette wrote: OMG lookit what HOT TOPIC has!!!!! Are you familiar with image hosting websites such as Imgur? Create an account. Upload your pics to the account. Copy the link to the picture you want to share. Now when you select the Submit button to complete your post you image should appear. I don’t parlay Francais so there is a language barrier with the website. PoolFan wrote: I don’t parlay Francais so there is a language barrier with the website. I don't speak or read French either. The weird thing is, I could have sworn the French site had a button/link to switch to English. The Belgian one definitely does. I work with a lot of stuff online in my job so I'm used to working my way around foreign language sites - looking for the similarities, etc. - and most online stores/forms follow the same basic patterns. I guess I just got through it all that way? I don't remember needing Google Translate. My need to own one of the limited-to-100-pieces X-Force statues was obviously strong enough to overcome the language barrier. Spotted this at my local Wal-Mart. PoolFan wrote: Spotted this at my local Wal-Mart. Bottlepops Talking Bottle Openers - they apparently talk when you use them to open a bottle. They're actually from an Australian company (!). 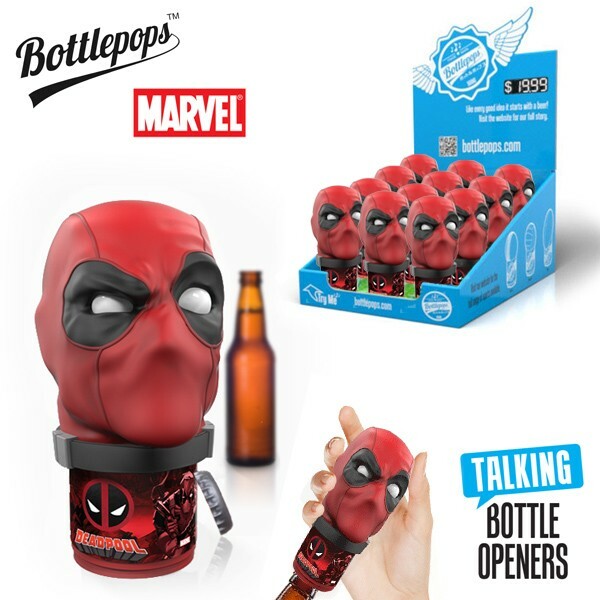 They're AU$20 if you're actually in Australia, or US$15 for everywhere else: https://bottlepops.com/products/deadpool - ships to "North America, United Kingdom, Europe, South America & Africa". Is it just me, or does this vaguely look like the styling on Bagley's cover to Deadpool Assassin? Maybe it's just the smile through the mask? Last edited by anthonyv8 on Sun Jun 10, 2018 11:28 pm, edited 2 times in total.